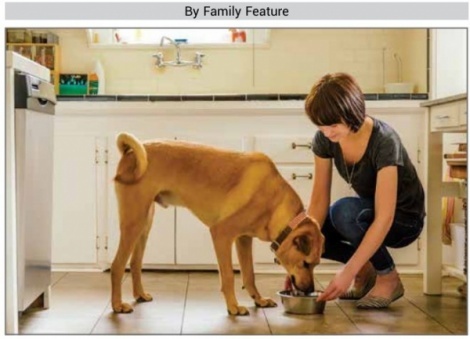 In a survey of dog owners, conducted by OnePoll on behalf of Mars Petcare, 9 out of 10 respondents said they try to incorporate clean foods into their diets at least some of the time, and 75 percent said their own eating habits have caused them to reflect on the quality of food they feed their dogs. * Terry Walters, best-selling author and dog owner, believes that clean eating – for both humans and pets – is about being mindful of what you eat and what you choose not to eat, as well as being more aware of the origin of the food in your diet. • Become more conscious of what you put into your body and how it affects your overall wellbeing. Keeping a food journal where you record what you eat, when you eat it and how it makes you feel is one way to recognize which foods are serving you and which are not. • Empower your family to make healthy choices by educating them about different foods and the nutrition they provide, and including them in everything from growing to cooking clean food. The more you know about your food, the healthier choices you can make and the more able you will be to achieve sustainable, good health. • Our four-legged family members deserve the best, too. Make eating clean a priority for the whole family, including pets. NUTRO. FEED CLEAN™ dry dog food recipes, made with non-GMO† ingredients, align perfectly with clean eating values and give dogs a nutritious diet that’s tuned exactly to their needs. The NUTRO. FEED CLEAN™ philosophy promises pet owners a dry dog food with recipes that are simple, purposeful, trustworthy and made with real, recognizable, non-GMO† ingredients as close to their native form as possible. For more information and tips, visit Nutro.com. Photo courtesy of Getty Images. *For the purposes of this survey, “Clean” was defined as incorporating whole fruits and vegetables, recognizable ingredients, products with short/simple ingredient list into your diet and avoiding artificial flavors, colors or preservatives. †Trace amounts of genetically modified material may be present due to potential cross contact during manufacturing. Wanted Young FarmersWhat advantages do so-called “vertical farms” have over traditional gardens and farms?Earth Day is Over… Now What?Q: What was the inspiration behind Raw Food?